Was there ever such a thing as an honest politician? Frequently dismissed as hypocrites, liars or simply idiots, our MPs are rarely trusted and frequently seen to be out of touch but Robert Chiltern might just be the exception. Idealistic, charismatic and blessed with an apparently perfect family life, Robert has cut a swathe through the House of Commons but Parliament can be dangerous place and when the conniving Mrs Cheveley enters the political arena Robert’s world comes crashing down. Will Robert be able to save both his morals and his marriage or will his career become just another political scandal? Oscar Wilde has always been one of Britain’s most popular playwrights though his plays are often presented as period pieces; taking a fresh approach, this production brings this classic comedy into a modern world and shows how Wilde’s incisive wit makes fascinating observations about our current political class. Derided, attacked and often regarded with no more than suspicion or indifference, politicians have possibly never had a worse reputation than today, with a hungry press and social media network tearing apart their every move with ruthless abandon. What better setting therefore for Wilde’s An Ideal Husband?Rooted in social and political circles that thrive off intrigue and gossip? When today’s MP’s and Party leaders seem desperate to appear trendy and in touch, Wilde’s story of corruption versus idealism is more relevant than ever. Venture Wolf Productions is proud to present a new version of Wilde’s classic comedyfor the 2014 Camden Fringe. 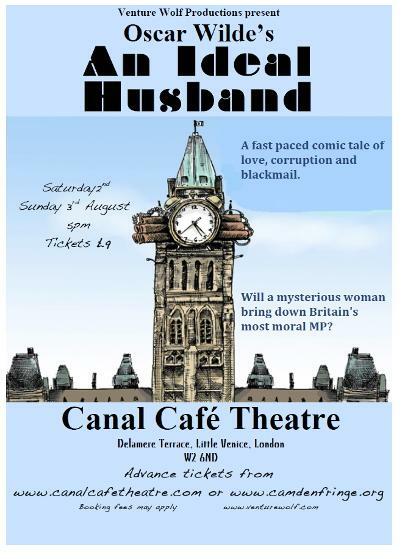 This summer An Ideal Husband invites you for a sharply funny look behind the doors of our leaders down in Westminster.